Nutrition Hub, a subscription based app with Fitbit integration, is the most powerful and user friendly app for managing nutrition intake on the Windows Phone. Nutrition Hub leverages the power of FatSecret, Nutritionix, and Fitbit for searching food databases totaling millions of generic, packaged, and restaurant food items. Nutrition Hub is essential for keeping track of your diet and weight loss. 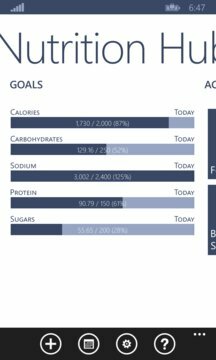 Add personal goals to quickly and easily track progress and consumption. 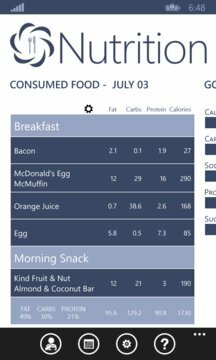 Nutrition Hub adheres to Windows Phone design principles so navigation and interaction will be familiar to any Windows Phone user. Updates are released on a monthly basis. -Search extensive food databases of restaurant foods, generic foods, and packaged foods. -Sync consumed foods to Fitbit automatically. -Scan Barcodes for quick and easy searching. -Add custom food if the food can’t be found in search. -Add foods to a meal to calculate the total nutritional value of the meal. -Add foods to a favorites list to quickly reference in the future. -Can view/track Net Carbs (Total Carbs - Dietary Fiber) Great for Atkins diet. -Set goals and track your progress. -Track 7, 14, 30, and 90 day averages. -Track 7, 14, 30, 90, and 180 day consumption history with a detailed graph. -Manage full consumption history. If you were to accidentally ‘consume’ a food you didn't mean to, press and hold the consumed entry for the delete menu to display.